I've seen the Haiti Presidential Sash here in this Bicentennial website. Caption of the picture reads: Thabo Mbeki, President of South Africa, is the only Head of State to visit Haiti in its bicentennial. The Sash shows the same colors of the Haiti flag, blue and red diagonally displayed from top right shoulder downwards. 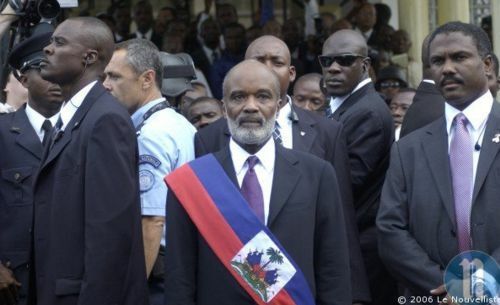 On the newspaper El Colombiano on the May 15, 2006 issue, there is a photograph of René Preval, elected President of Haiti back then. The CoA is added, touching the blue edge but not the red one. Oddly enough, it seems it is worn upside down. It is worn upside down. See these photos at <www.moun.com> and <www.potomitan.info>.